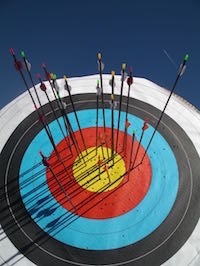 The club runs Introduction to Archery courses twice a year, typically in April and September. The course consists of six 2-hour�sessions: the first 4 are indoors on Wednesday evenings at Kenley Memorial Hall followed by 2 Sunday mornings at the Club's field at Warlingham Park School. Course details below. We can take a�maximum of 12�on the beginners and taster sessions (the "Places available”�figure is updated as each course fills up - but we may get late cancellations so it’s worth going on a�‘waiting list’ if you'd prefer an earlier course). We frequently get requests from parents about doing the course either just before or after their son or daughter takes their 1st lesson. Sometimes this is not possible if the class is full (they normally are). It’s certainly worth considering beforehand especially as you can have some friendly rivalry whilst encouraging and helping each other progress. Session 1: Welcome and introductions; safety in archery; basic equipment; warm up exercises; basic�shooting technique; shooting under tuition. Session 2: Safety reminder; shooting under tuition; introduction of the sight; talk on aiming; talk on different forms of archery. Session 3: Safety reminder; shooting under tuition; demonstration of various bow types and talk on equipment �selection. Session 5: (Sunday, at field) Safety reminder, review of technique; guided instruction. Session 6:�(Sunday, at field) Guided observation;�Course Competition; open forum; presentation of Certificates of Competence. After successful completion of the course you will receive a certificate of competence. This will allow you to join the Club, or any other archery club, should you wish. If you are considering purchasing equipment, you should first�read this document (pdf, 3.5Mb) and talk to a coach. However, we strongly recommend that you DO NOT buy a bow until after finishing the course and asking advice from a coach. When you've bought your bow, arrows, etc., make a date with one of the coaches to check the set up and to get help tuning the equipment to its most efficient level for you. We hold regular “Improvers” courses, for all members, usually at Kenley on a Wednesday evening. Cost is �5, maximum number is 8 archers. This may also involve video analysis of the archers technique with advice given where adjustments will be beneficial. The next course at Kenley is planned for�March 2020. Or sooner if there is demand. The�Coaches�(Dave, Gary, Jeff, Paul) are available to assist members select and set up�equipment, tune bows, review technique, etc should you want advice. Just discuss your requirements and agree a time/place at the Club. They’re always happy to help.